Weighed in this morning at 177 pounds, up two from yesterday. 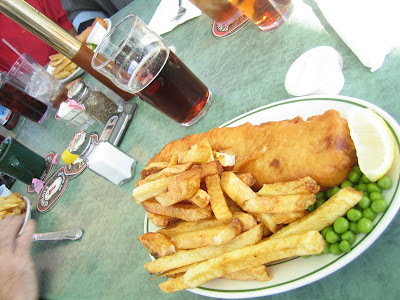 Yesterday, I had the fish & chips at Shakespeare's Pub in San Diego. Some friends and I rode our motorcycles there for lunch. I had the full dinner-size, everyone else had the lunch-size. I also threw down two beers there. The food is really good there, even the french fries are awesome. Later on, we stopped at Barley & Hops in Temecula, and I drank another beer, and then a cream soda, and helped a guy eat his pizza. And then there was the pretzels and hummus. For the past few years, the people that I ride with have always commented that we're an eating club with a riding problem. They've all mentioned themselves having gained weight because of getting together and riding motorcycles. I've also gained weight, up until I started this diet. It's the pressure (or temptation), of getting together with your friends, and having a good time hanging out. So when we're at a restaurant or bar, we all conform and order up some food and drink that would totally ruin our diets. It's the temptation of wanting to celebrate this friendship together, the comraderie, the brotherhood, of bonding together. That's part of what makes it tough for people to lose weight; doing as your friends do, when in their company. It seems like every diet plan ought to accomodate this. If a plan allows one to satisfy their urges to eat, drink, and be merry, it makes the overall dieting easier to withstand. Imagine me eating only beef jerky 7 days a week, and nothing else. I'd go absolutely nuts, and would find myself abandoning the diet. Instead, I do four days on beef jerky, and three days resorting back to my gluttonous ways. In reality, those three days are not always spent gorging. Sometimes, I still eat moderately, or eat something low in fat. It all balances out over the course of a month to give me a weight loss ranging from 0-7 pounds. I actually lose about 5.4 pounds per month since the 8 months I've launched this blog. There were a couple of months where I lost no weight, and some months where I lost as high as 7 pounds. I'm still giving myself plenty of opportunities to gorge on bacon, beer, pizza, etc. That helps to mitigate the desire to eat.